It feels like just yesterday I was reporting on last month’s results. 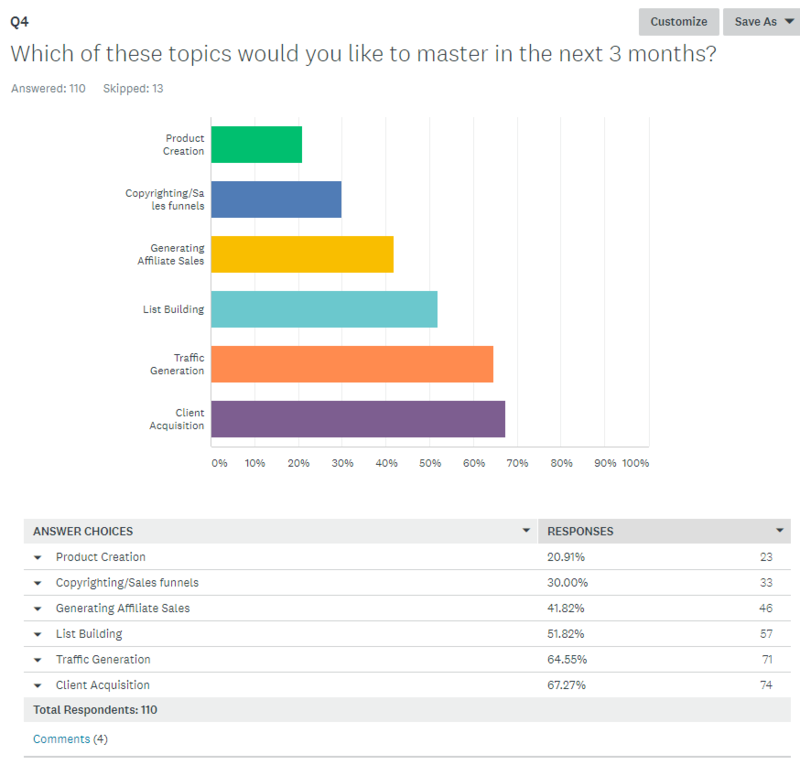 Last month I released another short survey, only 5 questions, focusing on traffic generation and learning topics. Before we go through the results, let me link you to the October survey here: October 2018 Digital Marketing Survey. Take few minutes to fill out that survey, it’s only 9 questions and will help me gauge the types of content you want to see in the future. With that, let’s dive into the results from last month. 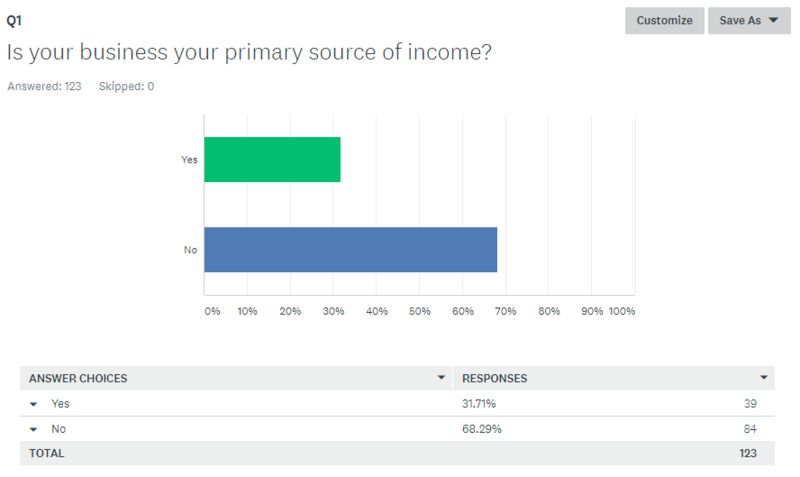 Only 30% of responses said that their business is their primary source of income. To be honest I found this encouraging. Most surveys that go out to internet marketing lists find that under 10% of their audience is full time, with the majority of customers not having made any money with their marketing efforts yet. The majority of my customers are using free social media as their primary traffic source, with Facebook Ads and SEO tied for second. 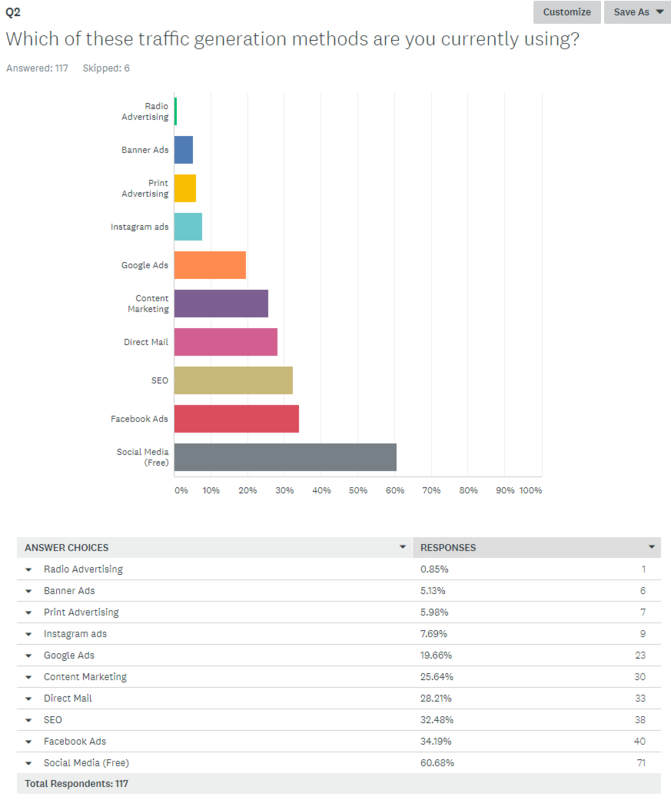 I was surprised to direct mail as high on the list as it is, however in the comments a few people pointed out that I did not include email as a traffic source, and so they chose direct mail to represent that. I imagine if I included email it would have been even higher, perhaps second place behind free social media traffic. This is practically a 4-way tie! SEO as well as the big online ad source… Facebook ads, Instagram ads, and Google ads are the hottest topics right now for people wanting to learn to generate traffic. Last month traffic generation was ranked as the biggest topic people wanted to learn, and this month it’s only behind client acquisition. Overwhelming students love online video as their preferred learning style over anything else. E-books coming in a distant second, with only 24% of people preferring webinars. Personally I love a good old fashioned paper back book and have been considering releasing my e-books in physical form, but it doesn’t seem to be as popular with customers as it is with me. Traffic remains the hottest topic outside of landing clients with social media and SEO being the hottest topics both free and paid advertising. Online video is the preferred way to consume content, and around 30% of customers are currently earning a full time income with their business. Thanks to everyone who participated in last months survey! Leave me a comment below to let me know your thoughts on this survey. 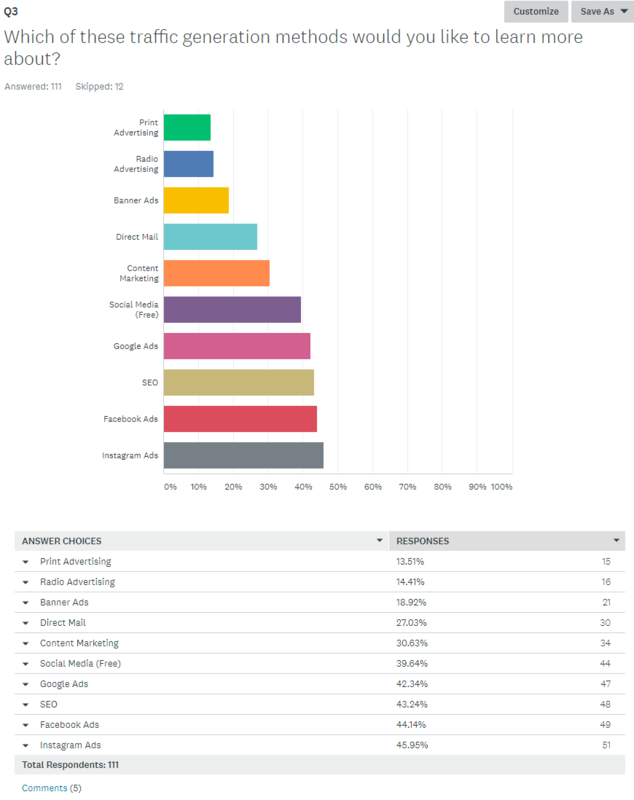 Last month I released my first ever digital marketing survey and got 110 total responses from customers and clients. I’ve decided to make this a monthly event, releasing the results of the previous month’s survey right here on this blog. Take minute to fill out that survey, it’s only 5 questions and it will help me gauge the type of content you would like to see in the future. Ok… On to the results. 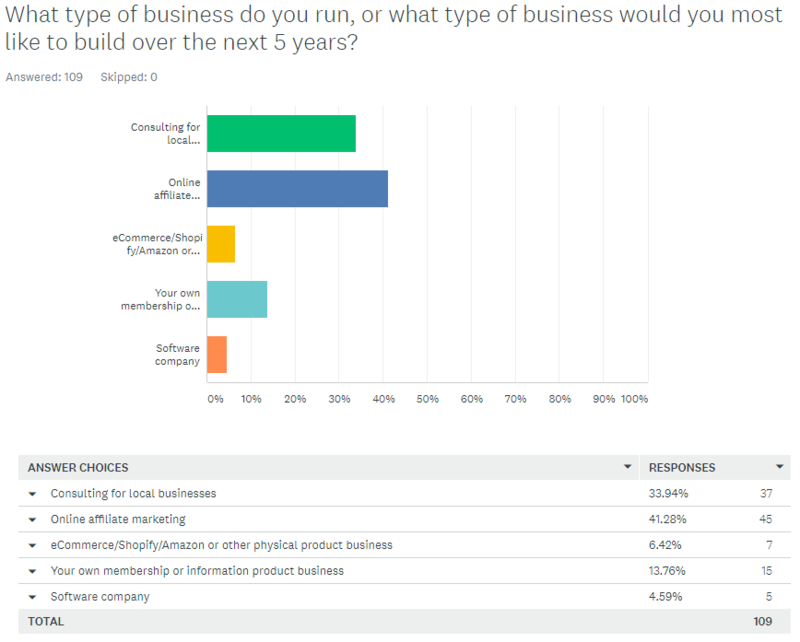 Survey Question 1: What type of business do you run, or what type of business would you most like to build over the next 5 years? 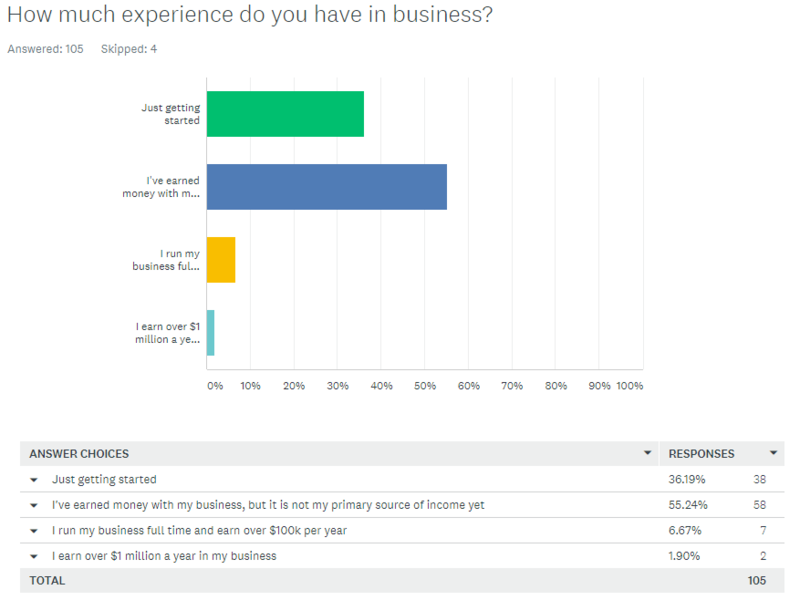 As you can see from above, 42% of responses want to build an online affiliate marketing business, with 33% wanting to build a business consulting for local businesses. 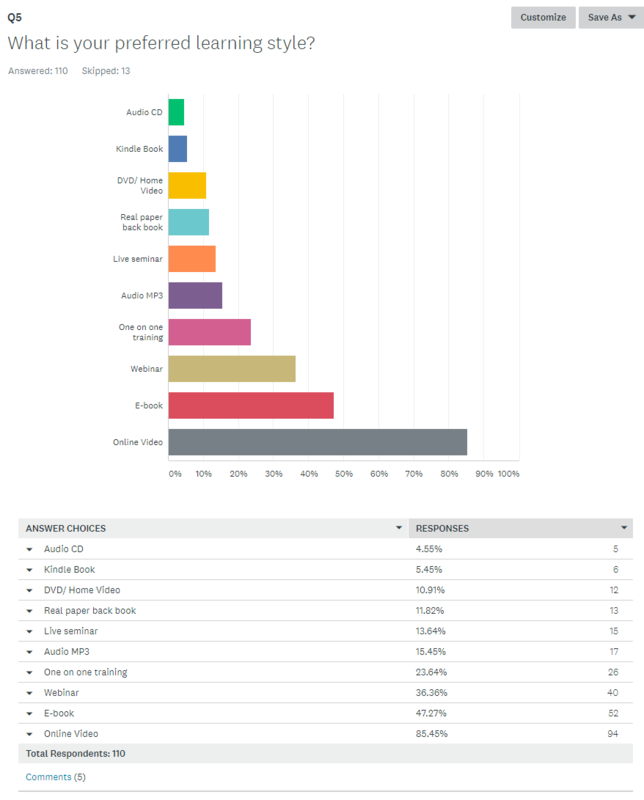 These results may be skewed slightly… I did release a course on affiliate marketing last month and the customers who bought that course were all sent this survey. I’ll be re-phrasing this same question in this months survey to clarify, but my customer base seems to be pretty even on wanting an online or offline business. 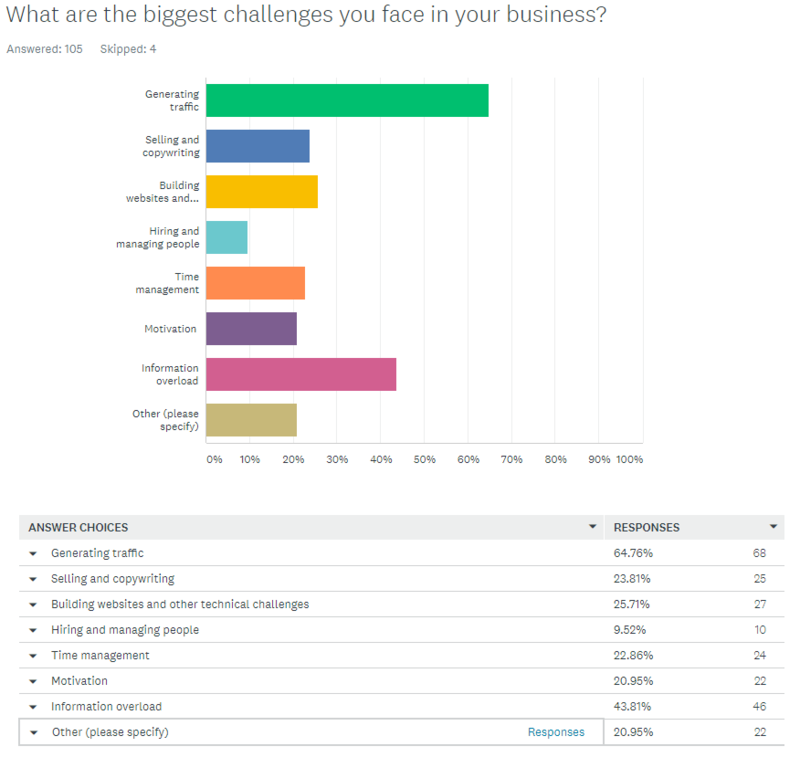 Survey Question 2: What are the biggest challenged you face in your business? 64% of responses say that generating traffic is the hardest part of their business. This is a great insight if you are looking to create a product for JVZoo or Warrior Plus. Traffic generation is a huge need in the market place and if you can take the time to solve this issue for beginners, you’ll have a clear winner (one that I would promote to my customer base). 44% said information overload is among their biggest problems. This is the biggest complaint I get from students and I’m not surprised that it ranked so high in the survey. This business can be overwhelming and it can often be hard to focus on one thing long enough to get the results you desire. 20% selected the ‘other’ category, and the number one reason they gave was lack of money to get started. It seems most people are trying to bootstrap their business with little capital to invest. I have a lot to say on this topic which I’ll be saving for a separate blog post (my business partner was an investment banker on Wall Street in a past life). Give me a shout in the comments section if raising capital and money management is a topic you’d like to hear about. Survey Question 3: How much experience do you have in business? 55% said they have earned money but it is not their primary income, while 37% said they are just getting started. I found these results encouraging! More than half of my customers are earning money with their online ventures and are looking to take things full time. Just under 10% have gone full time earning 6 figures or more. Fun fact: I can track customers in the members area and see just how far they get in my online courses. I find that just about half of the ones who start a course get through to the end. 50% of customers actually finish the courses they buy, and 50% of survey responses state they are earning money… Coincidence? I’ll let you decide. Survey Question 4: Would you like private, one on one coaching in your business? The results here are pretty split down the middle. Most of the no answers commented that they don’t have enough money for coaching, or want to get started earning money before they take on a private coach. Half of my customers are building online businesses, while half are building consulting businesses. I want to thank everyone who participated in the survey. I’ll be making this a monthly event so look out for an email in early October to see the results of the September survey. In the mean time, leave me a comment below and let me know your thoughts on these results as well as any questions you think I should add to future surveys. © 2019 White Wave Media LLC All Rights Reserved.